One of the casualties of this lack of energy has been my crafting. I had all these plans, back in September, upon finishing the curtains for Carole and Larry's house. I bought bits and bobs and finishing items. I was going to sew. And then the fatigue set in. All my ideas are in bags in the office. Last night, however, I sat down with a hunk of fabric. Darth Vader and crossed light sabers. I've had this fabric for some time. I can't really divulge what the project is, just yet. In my mind's eye, when I bought this, it was to have been finished by October. Well, that didn't happen. I took the fabric out of the bag and draped it over the recliners, to taunt me, of course. That didn't work either because here it is, December 11th, and last night I just cut this out. Pinning and cutting is my absolute most hated job when making anything. Oh lord. If I could hire someone to do that chore, I would. I couldn't find my cardboard cutting board either. Although the table works fine because it's big, it has slats and that can make for difficulties in cutting when the scissors go into the slats. But, this project is cut out. 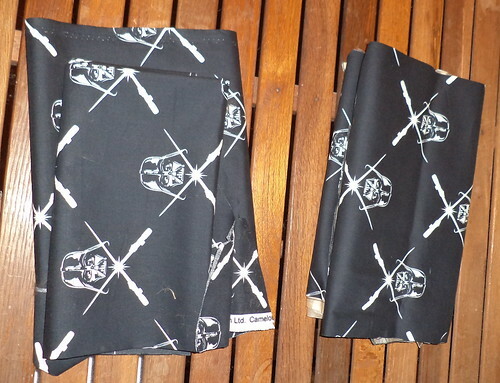 When I bought the fabric, I didn't have the pattern with me so I estimated, or "guess-timated". Of course, I wind up with about 18 inches more than I needed but that's to be preferred. Now that it's cut out, I will find it much easier to finish. There are more projects upcoming, easy projects that I can get done before Christmas, if I just have the energy to finish them. 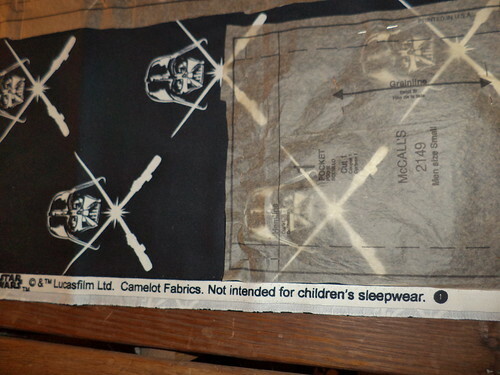 Another side effect of this is searching out Camelot Fabrics, the maker of this. Oh my. I'm going to have to bookmark this site.They have a sewing blog where I can dream about having all this time to sew. I found a link to order the fabric I bought for Carole and Larry's kitchen curtains. If I ever get around to finishing the quilt I have, I should probably start here for complimentary fabrics. So, I'm full of plans. Will the energy hold?